An old friend of mine was given the news by his doctor on Friday that he has a matter of months to live. This followed the discovery of an aggressive and inoperable brain tumour, after a CT scan last week. I spoke to him while he was still at the hospital but finding the right words or indeed, any words but might seem more than inadequate platitudes, was a struggle. After all, what can you say once that kind of sentence of the inevitable and inescapable, has been delivered by a doctor, as factually as a judge donning his black cap in court? So in the coming weeks, all his friends are planning a big party for him, as he's a tough and irascible b***d and would rather have us celebrate his wake standing-up with a glass in his hand than lying down surrounded by people in black ties and long faces. I think that's an attitude that many, if not most of us, would understand and share as well. Yesterday morning I was up early to do a couple of jobs and was surprised to find my aircraft coated in ice. Kent and Essex were bathed in brilliant early morning sunlight, as I landed at an empty Damyns Hall to find the Good Year airship sitting on the disused runway, where I planned to set-up a banner. A little later, a small army of ground crewman arrived and wrestled it into the air forty-five minutes later. Watching it all, I concluded its driven by a chainsaw motor and is one complicated exercise. 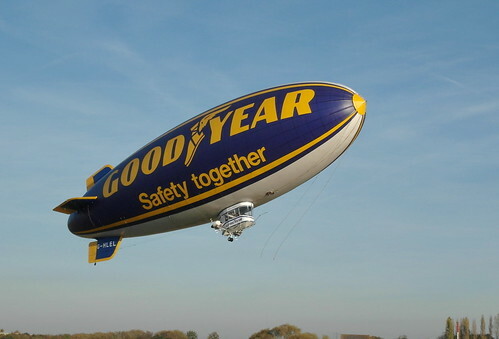 Lord knows how they ever managed to get the giant airships of the 1930's airborne? I'm not very good at recognising celebrities and so for yesterday morning's job, I must have appeared a little naive when I asked the client how I might recognise the house on a very long road in the countryside. "It's like David Beckham's house" she said and so at that point I assumed I was looking for something quite large and ostentatious and I wasn't wrong! I've had a few occasions when well-know celebrities, both sporting and entertainment, have called-up for a flight and it wasn't until after the event, that I realised who they were. Some of course are obvious and I know where Jordan and Paul McCartney and Andy Murray have their homes, tucked well away from public gaze and with a space between them and the paparazzi. Back to airships then, and a couple of years ago, one old chap in Westgate showed me a photograph of the Hindenburg flying over Westgate that he had taken while it was spying on our airfields. When you think that the German airship was larger by orders of magnitude, it's a wonder that until the disaster that destroyed it, it commuted between Berlin and New York on a regular basis. My father once told me he saw it flying over Madrid as a boy living in Spain before the Spanish Civil War. I recall watching Jade Goody in a helicopter on the way to her wedding venue. I had no time for her as a person, I thought she was a pretty awful example of humanity when she was in the Big Brother house, in common with many I assume, but after she knew she was dying, and having arranged her wedding hastily, I watched as tears came to her eyes on that last flight. She had seen the sunset and realised that this was the last time she would probably ever see something as beautiful. It was at this point that I saw her in a different light. Tears rolled down her cheeks and you couldn't fail to be moved by her wonder at the view she had of the sun going down. As for your friend, could you not take him up and let him see again how lovely a sunset can be ? Sadly, cancer robs us all of good friends, loved ones and cherished family, it is all about 'how' you deal with it and I hope if I am struck down with something as terrible, I will have the chance to stop and look at a sunset. The Daily Mail today summed up the EU vote very clearly. David Cameron says no, now what's the question. We have seen 111 MP's brave enough to defy the whips and already Adam Holloway has resigned his PPS post to follow his conscience. How is this democracy ? The decisions, it seems to me, are all made by the three whips who tell MP's what they are going to vote for ! At least the 111 can hold their heads up high, I hope they are listed, then we will, at least, have some idea of where to put our cross in May 2015.